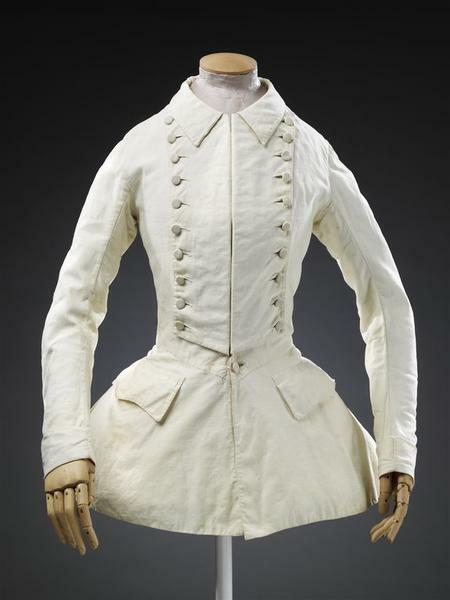 This is a woman's riding jacket from the 1760s in the characteristic double-breasted style. What is unusual is the light-coloured, lightweight fustian (a cotton and linen mixed fabric), which is clearly a concession to hot weather or a warm climate. Most surviving 18th century riding habits are wool, which would be suitable for a British summer. In the 18th century, a woman's riding habit consisted of a jacket and petticoat, and often a waistcoat. The jacket and waistcoat were cut in styles resembling men's coats and waistcoats. In addition to riding, these practical ensembles were also worn for a variety of outdoor activities - walking, skating and any sort of travel. 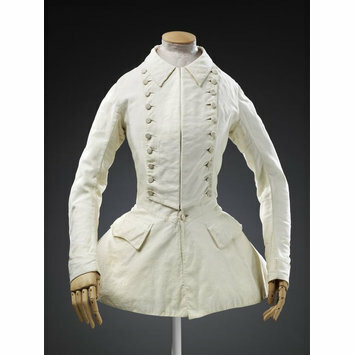 Although white seems impractical for 18th century travel, unlike the wool varieties, this jacket would have been washable. William Hoare's pastel portrait of Miss Vernon (1760s, Attingham Park) shows her wearing a very similar double-breasted white or very pale grey riding jacket. 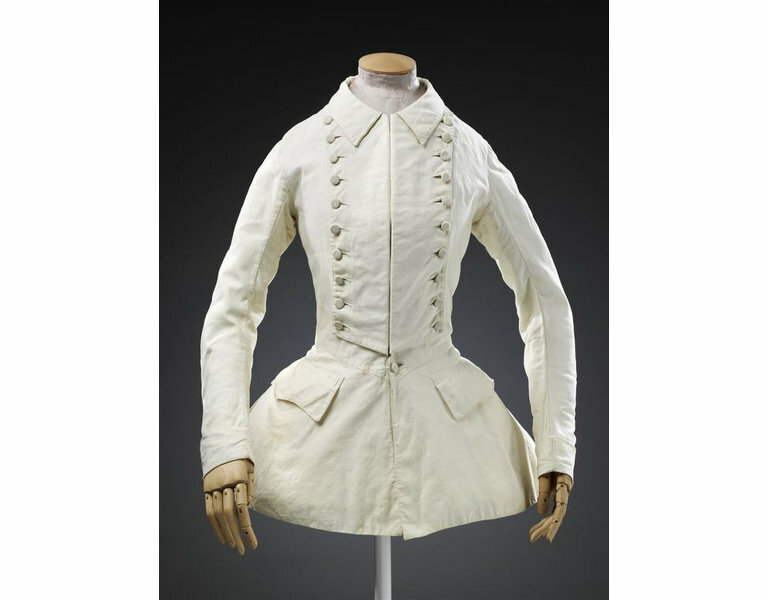 A long-sleeved woman's riding jacket of white fustian (cotton weft/linen warp) twill, linen with linen. The jacket is true double-breasted with 10 fustian-covered buttons and 10 button-holes on each side. It has a waist seam, flap pockets and narrow cuffs.